For those who can afford them, exquisitely designed green dwellings fitted with every kind of energy-saving gewgaw are all the rage. But what about those of us who live in the world of small apartments, cracker-box condominiums, tract houses, and drafty old Victorians? Are we condemned to schlep around our admittedly pedestrian homes, leaving gigantic carbon footprints simply because we can't afford the latest in earth-friendly housing tech? Frank Schiavo bought his San Jose, California, home new in 1978 for $63,500. It was pretty standard--indeed, it was exactly like 500 other houses in the same development. And like them, it was a voracious energy hog. Schiavo, a former high school teacher and retired environmental studies lecturer at San Jose State University, found that intolerable. He was determined to retrofit his home to jibe with his environmentally progressive sensibilities. "The trouble was that I was a retired educator, so I didn't have a very large budget," Schiavo recalls. "I had to keep things simple." Schiavo's remodel centers on passive solar heating--in the form of a 40-foot sunroom attached to the back of the house. The room contains exterior windows as well as interior windows on the back wall of the original home--all double paned, of course; the floor is brick. During the winter, Schiavo says, the sun is low in the sky, and most of the thermal energy is directed to the floor. The bricks heat up until the room is positively torrid. "Then it's just a matter of opening up the back windows to the house and letting the hot air flood in," he says. In the summer, Schiavo notes, the sun is high in the sky, and the floor is shielded from intense rays by the eaves of the house. "It seldom gets all that warm in the sunroom then, and when it does, you just open the windows and let the heat vent," he explains. Schiavo has installed rigid foam insulation beneath his home's exterior siding, fitted solar hot-water panels over his garage, and installed small photovoltaic panels--enough to supply 800 watts when the sun is bright. He also replaced all his incandescent lightbulbs with compact fluorescents, uses a clothesline instead of a dryer, and washes his dishes by hand. Next up: an energy-efficient furnace. "I'm pretty happy with the results so far," says Schiavo. "In August, my electric bill was $13.70. Of course, it goes up in winter--it may reach $25." 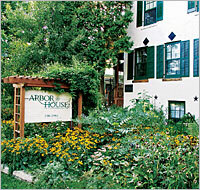 In 1994, when Cathie and John Imes bought the Arbor House--a historic building in Madison, Wisconsin--they had visions of an environmentally friendly bed-and-breakfast for eco-conscious travelers. They got their wish. The Arbor House complex--which includes the original 1853 building and an annex they added--now hosts more than 4,000 guests annually. But it took a lot of work and a fair amount of frustration. As Cathie recalls, building the annex sustainably was far easier than retrofitting the original structure, a popular watering hole and dance hall for local gentry in the mid-19th century. "Because the Arbor House has national-landmark status, we couldn't just wade in there and start ripping things up," she says. "Every move had to be vetted and approved by an engineer specializing in historic structures." That wasn't cheap. "Right now we need a new roof, and our engineer was just out here to examine it," Cathie says. "It was expensive just for him to look at it. I almost fell over." Still, she and her husband are businesspeople, and their efforts have penciled out to a profitable bottom line. The inn employs high-efficiency hot-water heaters and radiant in-floor heating systems that are 95 percent energy efficient, says John. The wood used in the renovation was either recycled or from Forest Stewardship Council-certified sources. The windows are triple paned for energy efficiency, the fixtures and faucets are designed for low water use, the floor tiles are fabricated from recycled glass, and the carpeting is 100 percent wool. Along with sustainability, health is a guiding principle at the inn. "All our caulking is low toxicity, and we use solvent-free mineral silicate paint," John says. Compact fluorescents, dimmers, and motion-sensor light switches keep electrical consumption to a minimum. Arbor House is also a Wisconsin wind power sponsor--the inn pays a premium on its utility bill to support wind-generated electricity production in the state. "It's in keeping with our philosophy and a good marketing point," Cathie says. The biggest challenge in the greening of Arbor House? "Installing the windows," according to Cathie. "The walls are 12-inch-thick stone. 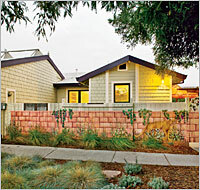 Putting in modern thermopane windows while maintaining the historical integrity was an ordeal." It may sound like something out of a Road Runner cartoon, but the Acme Building in downtown Billings, Montana, is real--and a godsend to the city's low-income residents. 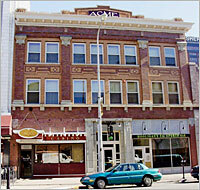 Like the Arbor House, the Acme is listed in the National Register of Historic Places. Built in 1911, the former theater and commercial venue was in pretty sad shape when it was acquired by homeWORD, a nonprofit affordable-housing provider. The group gutted the Acme and rebuilt it with the environment in mind, keeping the lovely brick and cast-stone facade intact. The project was finished in 2004, with 19 apartments on the upper two floors that rent for $250 to $450 monthly. The low-income flats are largely subsidized by ground-floor commercial businesses, which pay fair market value. "It was a wonderful project because it allowed us to preserve one of the town's most beautiful old buildings and create housing that was both environmentally sound and affordable," says Jennifer Betz, an asset manager for homeWORD. The Acme has been equipped with an 18,000-watt photovoltaic array--one of the largest in the state--providing much of the apartment dwellers' electrical needs, says Betz. Many of the building's original materials were salvaged and used in the remodel, including wood flooring, trim, doors, and the main stairway. The heating and cooling systems are energy efficient, and minimal PVC piping was used. All the plaster removed during remodeling was composted rather than taken to a landfill, and cabinetry, decking, and interior doors are made of composite-waste wood. About 1,700 pounds of copper and brass were removed and recycled; the radiators--totaling ten tons in weight--and more than 40 sinks were removed for reuse. Roadblocks were predictable--mainly finding the $3.4 million the project required. Funding was ultimately obtained through federal low-income and historic-landmark tax credits, city housing programs, and various loans and grants. As with the Arbor House, planners had to take pains to preserve the building's historic aspects. Despite the tribulations, tenants are happy with the results. The building has been booked solid since its opening. "A lot of times, affordable housing isn't in optimum condition or in the best locale," says Betz. "It's nice to provide our clients with a truly comfortable, healthy place to live." Glen Martin covered environmental news for the San Francisco Chronicle for 17 years. He wrote "Yeeehaaa!" (about off-road vehicles) in Sierra's November/December 2007 issue. Photo at left by Paul Dyer; used with permission.